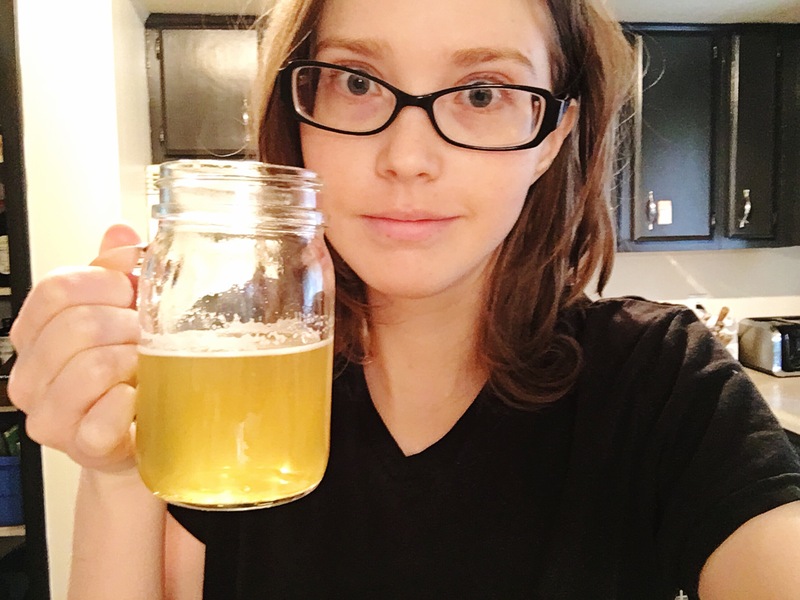 One of my favorite healthy-living bloggers, Back to Her Roots, used to do these What I Ate Wednesday posts almost every week, and I enjoyed the peek into her normal, everyday eating routine. I thought some of you may be interested to see an example of what I eat these days, especially since I’ve talked a lot lately about how I’m trying to incorporate as many healing foods as I can into my diet. A few notes before I jump in: First, none of these links are affiliate links – I don’t get anything if you click them – I just wanted to provide further info for those of you who are interested. Second, this is not intended as a guide for anyone else’s diet or healing regimen. This is just one part of my current healing plan, and these are foods that I have found to work for me in this phase of my healing journey. Everyone is different! Okay, now that those are out of the way, let’s jump into it! Honey water (aka honey tea) with frankincense. (I forgot to take a picture because I had just woken up and my brain was still sleepy, but here’s a selfie from last week that I shared on Instagram.) Here’s how I make my honey tea: 1 tbsp raw honey + 1 cup warm water + 1-2 drops of food-grade frankincense oil. You could also add cinnamon, turmeric, and/or lemon for even more healthful benefits. This drink is surprisingly filling, so I’m usually not hungry for another hour or so. Coconut kefir with cinnamon. Y’all. Incorporating live probiotics into my daily diet has completely and legitimately turned my health around in just 2 weeks. I can’t overstate how much better I feel since eating them every day. This specific kefir has a yogurt-like consistency – much thicker than the more common liquid kefirs I’ve had before. I add cinnamon for the taste and it’s various benefits. 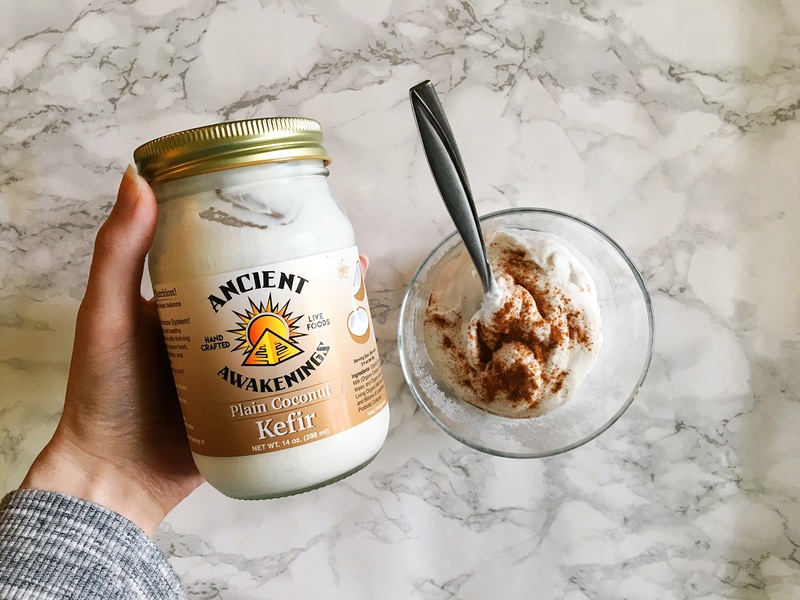 This Ancient Awakenings coconut kefir is amazing. Unfortunately, it’s not available everywhere because (from what I can tell) it’s just a small business that has only just started testing in a limited market – I’m beyond grateful that Nashville is one of the few places it’s available. Fingers crossed they’ll continue their expansion! 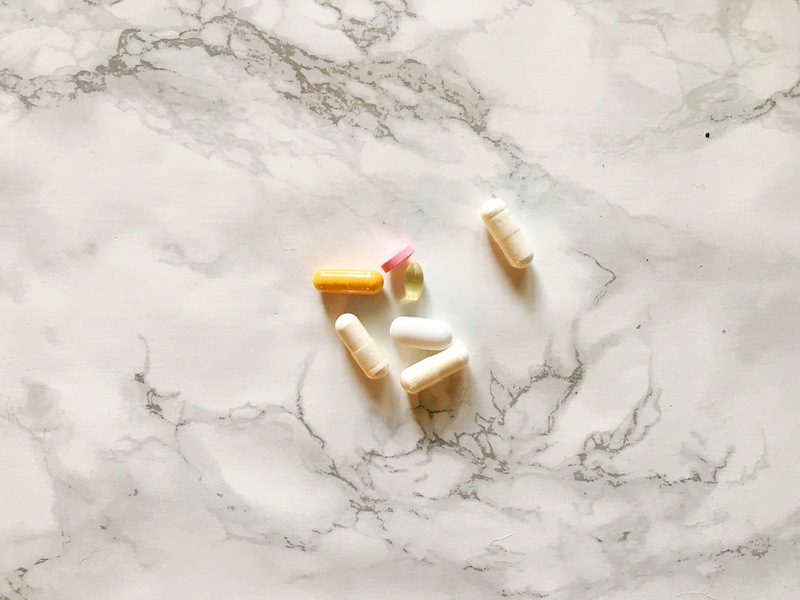 Turmeric (for inflammation and mood management), B12 (for energy and digestive support), vitamin D (for autoimmune support and overall health), magnesium (for energy and digestive support), and a glucosamine chondroitin & MSM complex (for gut & joint health). I take these with about a quart of water. Walnut bread (recipe previously shared here), topped with dill pickle sauerkraut. 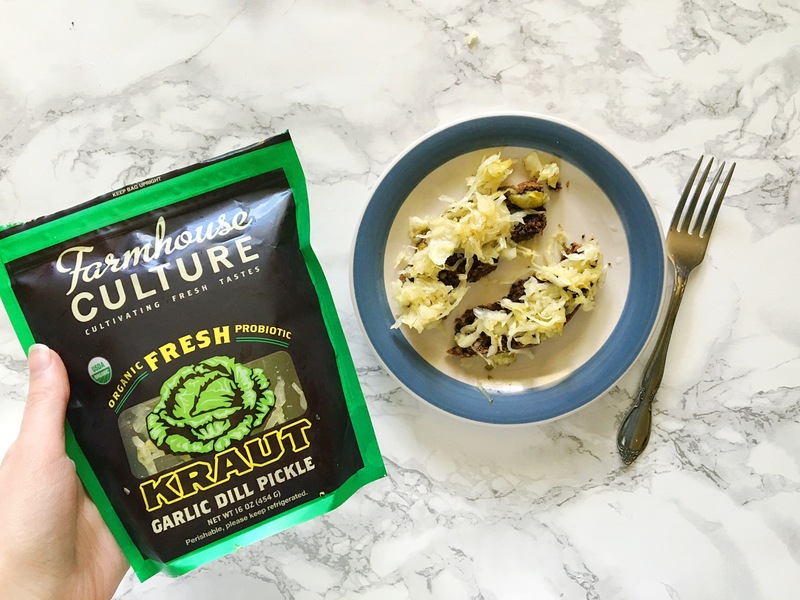 – This DELICIOUS, probiotic sauerkraut is from Whole Foods. The walnut bread is protein-packed and quite filling, so even though it doesn’t look like a lot, I didn’t get hungry again for a few hours. 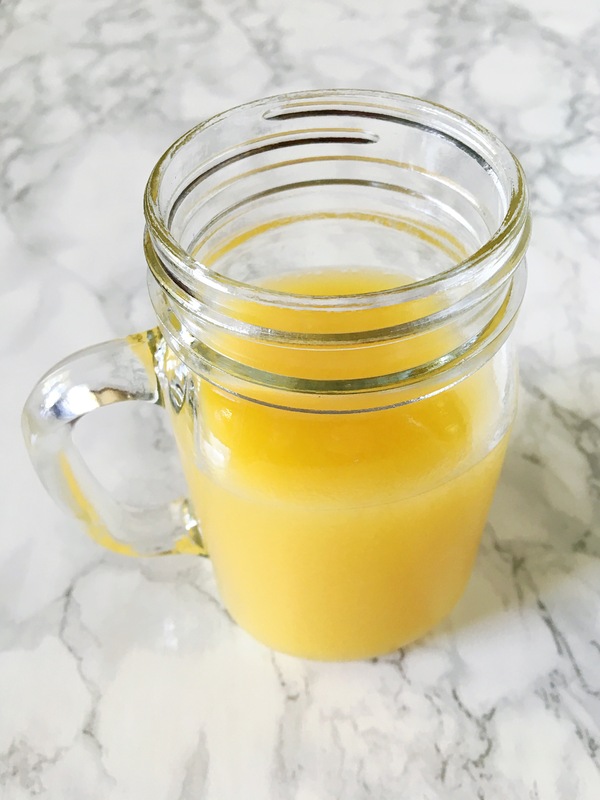 Pineapple juice. Pineapples are bursting with bromelain, which is an enzyme that helps with digesting protein.. great for anyone with digestive issues. Two Boiled Eggs with LOTS of Himalayan Salt. I like my boiled eggs somewhere between soft-boiled and hard-boiled. I usually just bite into the egg whole and dip it into the salt as I go. So yummy! Home cooked sweet potato fries, a “sauercado” sprinkled with paprika, and a slice of walnut bread with almond butter & cacao nibs. A few notes: First, I had planned to roast a chicken for dinner and get a batch of bone broth going, but a pipe burst under our sink and threw off my plans for the rest of the day. Thankfully, it was an easy fix (Josh is my hero), but after all the clean up and everything I didn’t feel like spending any more time in the kitchen than I had to. So I threw some almond butter on a piece of walnut bread and called it my protein. Second, I actually saved the sauercado til later because I got full after eating the sweet potatoes & walnut bread. From this point on, I got busy & then lost the light, so I abandoned the marble “countertop” (it’s actually just cheap contact paper laid out next to a window, shhhh) and took some quick, in-the-moment photos. Dried mulberries, cacao nibs, and bee pollen. I wasn’t super hungry, but I wanted something sweet and crunchy to snack on while I blogged. So I mixed up about 1/3 c of this superfood trail mix (added the bee pollen after taking the photo). This is a good combination because I’ve found that on their own, mulberries are a little too sweet, and cacao nibs are a little too bitter, but when you mix them together they taste kinda like actual chocolate. Chocolate almond “milkshake” smoothie. 1/2 frozen banana, ~1/4 cup coconut kefir, 8oz unsweetened almond milk, a scoop of almond butter, 1 tsp cocoa powder, collagen powder, cinnamon, turmeric, vanilla, and topped with cacao nibs. Thanks for sharing. I’ve recently started working on my diet because I have such a hard time with food. I would really like to try the coconut kefir. I want to like sauerkraut so much, but that’s a tough one for me. That smoothie looks great until I read some of the ingredients and feel like I may not get through it. . . ugh I used to always have chocolate (fair trade of course) on hand. In middle school a girl said, “Every time I turn and look at you, you are eating something.” I have learned to start snacking on nuts and seeds now this week in trying to be healthier in my eating habits. I actually eat boiled eggs regularly already so that is awesome you do that too. Sometimes I will make it into egg salad on bread, but not all the time. Not sure if the Mayo is a good idea for me. haha. That drink that you have. . .the honey tea. . .sounds really interesting! I am just starting to drink tea (I just started this year. . .never tried tea until a couple years ago when my friend made me try teavana samples with her). I actually got an email from Eden’s Garden (the essential oils I use) about Frankincense. Made me really find it interesting to learn about! DOes that tea taste good to you? You said it is filling. . but flavor-wise, is it good?? I always used b-12, Vitamin D, Vitamin C, iron, Flaxseed Oil (umm, i have constipation), and regular Vitamin B – all really because I have anemia which somehow has improved after suffering from it since I was a pre-teen, but I stopped alllll of the vitamins in September. I picked up on b-12 again two weeks ago. Turmeric sounds like something I should look into. I swing in moods too much. Essential oils have improved a lot of things in me though so we’ll see if I try more vitamins or continue in those instead…Thanks for the tips and for this post. It is again inspiring and motivating. I am such a BAD eater!!! You made your own sweet potato fries??!?! Recipe coming soon?? I love sweet potato fries! The chocolate & cinnamon mask the turmeric (and the frozen 1/2 banana – it’s just there for a little sweetness & a smooth consistency). The kefir isn’t necessary, either – you could use yogurt instead OR just leave it out. My smoothie strategy is just to throw in as many good things as I can and then cover it with fruit or chocolate taste, haha. I really like egg salad too, but I’m trying to eat less mayo also. I might make my own, I’ve heard it’s pretty simple! The honey tea tastes good – it’s VERY sweet (that’s probably obvious) – and i can barely taste the frankincense. Sometimes I make it without. You can play around with it, too – adding cinnamon or lemon give you such different tastes! I like it. I can do a sweet potato fry how-to post soon! It’s really easy. It’s barely a recipe.